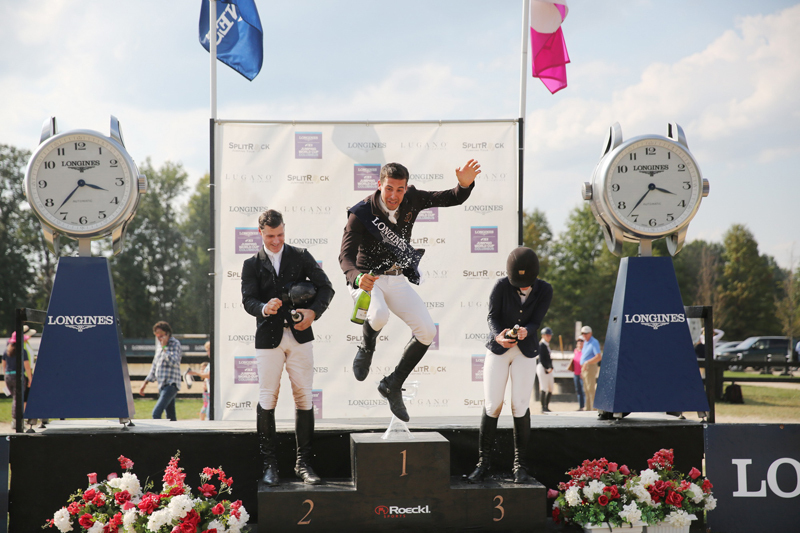 A victory in the $135,000 Longines FEI Jumping World Cup™ Columbus stamped the 10-year-old Zangersheide Victer Finn Dh Z as a horse to watch this season on the North American League. Eugenio Garza Perez (MEX) rode the bay gelding to the top of the podium in the horse’s World Cup qualifying debut. After missing nearly a year of competition while recovering from injury, Victer Finn Dh Z showed off his ability—and his fitness—by topping a jump-off field of 10. The pair crossed the timers in 41.33 seconds, less than two-tenths of a second faster than Peter Lutz (USA) and Robin du Ponthual (41.49 seconds), veterans of the 2016 World Cup Finals. Kelli Cruciotti (USA) and Chamonix H (42.65 seconds) finished third. Alan Wade (IRL) set the track for the newest leg on the North American League, which saw 39 combinations compete. The field featured four veterans from the 2018 Longines FEI Jumping World Cup™ Final in Paris (FRA), including Kristen Vanderveen and Bull Run’s Faustino de Tili, Charlie Jacobs and Cassinja S, Alison Robitaille and Ace, and current World Cup champions Beezie Madden and Breitling LS. After recording her first World Cup victory in New York with D’Arnita, Molly Ashe Cawley (USA) solidified her place atop the east coast sub league standings of the Longines FEI Jumping World Cup™ North American League with an eighth place finish in Columbus aboard another mount, Cat Ballou. She boasts 29 points. Mattias Tromp (USA), who finished third in New York, also proved his consistency, finishing 10th in Columbus and securing second in the standings with 22. Sacramento’s World Cup winner, Wilhelm Genn (GER), sits third with 20 points. Eve Jobs (USA), who finished fourth in Columbus, is declared on the west coast, and she now leads those standings with 24 points, ahead of Karrie Rufer (21 points). Garza Perez has moved into a joint third with Uma O’Neill, who won in Vancouver. They each have 20 points. Competition continues on the west coast at Del Mar, CA (USA), on 21 October 2018.